Sardines, those small, oily fish, are a staple in the Mediterranean diet. Including sardines -- canned or fresh -- in your diet not only provides you with a host of nutritional benefits, but it can help reduce hair loss. Sardines are rich in essential fatty acids, protein and iron, all of which are needed to keep hair healthy. 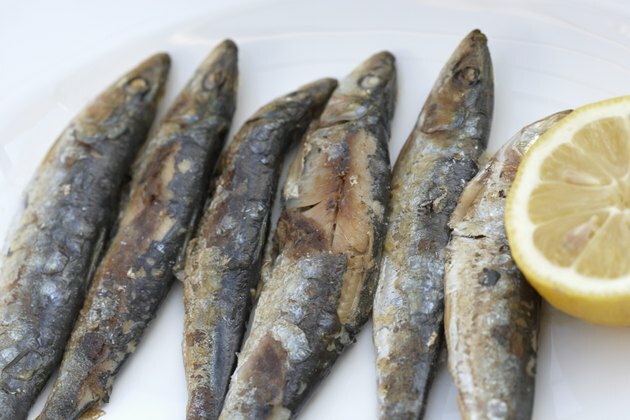 Include sardines once a week in your diet to get the health benefits of this seafood. A 4-ounce serving of canned sardines has 236 calories and almost 28 grams of protein. If you don't have enough protein in your diet, possibly because of crash dieting, you can start losing hair, according to the U.S. National Library of Medicine. While most Americans get enough protein in their daily diet, the U.S. Department of Agriculture recommends that you eat at least 8 ounces of seafood a week. A 4-ounce serving of sardines not only helps you meet half of this recommendation, but it helps you reach your daily goal of 5 to 6 1/2 ounces of protein foods each day as recommended by the USDA. Sardines are fatty fish rich in omega-3 fatty acids, the polyunsaturated essential acids that your body cannot produce on its own. A 4-ounce serving of sardines has almost 13 grams of fat, the majority of which is unsaturated. The 5.8 grams of polyunsaturated fat per serving make up 45 percent of the total fat content in a serving of sardines. In addition to reducing inflammation, helping with brain function and healthy growth and development, omega-3 fatty acids also promote healthy hair growth. A study published in the "Journal of Clinical and Aesthetic Dermatology" in 2012 found that taking a supplement of omega-3 fatty acids for 90 days led to improved hair volume and thickness in women with thinning hair. It did not help increase the number of hairs the women had, however. Iron is an essential mineral, and a 4-ounce serving of sardines has 3.31 milligrams. This provides 41 percent of the recommended intake per day for all adult men and for adult women over the age of 51. It provides 18 percent of the recommend intake per day for women 50 and under. Pregnant and lactating women may require more iron, and they should consult a medical professional regarding their iron intake. Iron helps build red blood cells as it aids with the production of hemoglobin. A study published in a 2009 issue of "Acta Dermatovenerologica Croatica" found that having low iron levels increased the amount of hair loss in women. Sardines are versatile, and you can find them canned in water, oil or tomato sauce in most grocery stores. High-quality canned sardines are frequently packed in olive oil and sometimes include spices such as lemon peel or hot pepper to add extra flavor. Sardines, which can also be purchased fresh or frozen from many ethnic grocers or fish stores, take well to high-heat cooking methods, such as grilling, sauteeing or broiling, in which the heat sears and crisps up the delicate skin. Dress grilled or broiled sardines with nothing more than a bit of sea salt and lemon juice for a low-fat, healthy and quick-to-prepare dish.